This article has been viewed 11044 times. There are multiple types of the flu virus; H1, H2, H3, H6, H9, H7, H5N1, H1N1. Each of these is a little different. Instead of having a different vaccine for each virus the hope is to have a universal vaccine that will help build up immunity to all the types of flu viruses. Every year people are affected by the dreaded flu. What is the flu? So many people have had a type of the flu and yet do we even know what it is. The flu is a highly contagious viral disease. Even though the flu comes and goes through most people's immune system it can and is fatal in many cases every year. The Centers for Disease Control and Prevention have said that an average of 23,607 people die from the flu per year. Researchers are one step closer to providing a universal flu vaccine that will prevent people from dying from the flu. 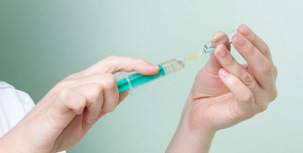 This vaccine will not completely protect you from the flu. The vaccine uses a protein which targets all the flu families. The scientist conducted the study using mice. They gave some of the mice the vaccine and other received no vaccine. Both types of mice were then exposed to the differing flu viruses. Both groups of mice became sick but their level of sickness differed dramatically. None that received the vaccines died. The hope is that further research will be done to ensure a safe and reliable vaccine that will be used to stop the flu from taking the lives of 23,607 each year.